About A little tribute to one of the best. Scanned from a Kodacolor Gold 200 print, taken in summer 1999 during a practice session for the Canadian Open in Montreal. Converted to B&W, levelled, and adjusted in Photoshop. Converted back to colour and toned with a slight brown tint. This one was taken at a practice court in Montreal. He was with Brad Gilbert at the time. 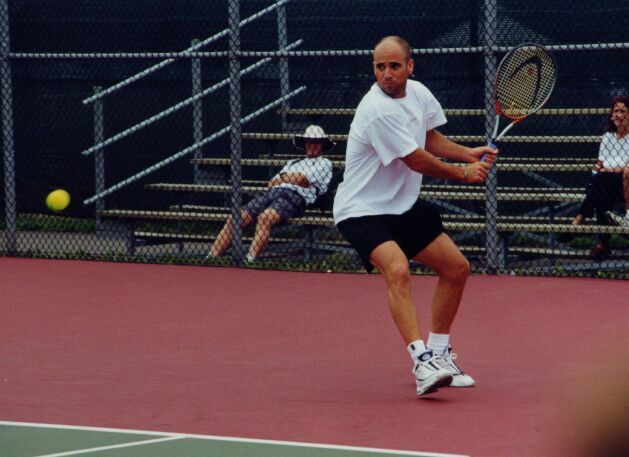 This is a great photo shot of a great tennis shot by one Andre (Denis)of another Andre (Agassi). Quite a few similarites of shot making between the two Andre's! Lol. You caught Agassi in a great two handed backhand shot, and that effect you created, black & white then toning it slightly with brown tint, gave the whole feel more impact in my opinion. Good photo and great topic matter! Hope you are having a great Christmas! I looked through your pbase tennis images. I see some familiar faces and some not so familiar (local tournament players I assume) I have a lot of images of Thomas Johannessen from very close up because we were sitting quite close behind him at a tournament a couple of years ago. Also some of Jonas Bjorkman. I'll send you some of the better ones if you like. I suppose his retirement marked the end of another era. One of the things that makes his career so interesting was the up and down aspect. Reaching the top, falling down low in the rankings and then reaching the top again is what makes an athlete truely great. I took this one during a practice session for the Canadian Open in Montreal, a few years ago. 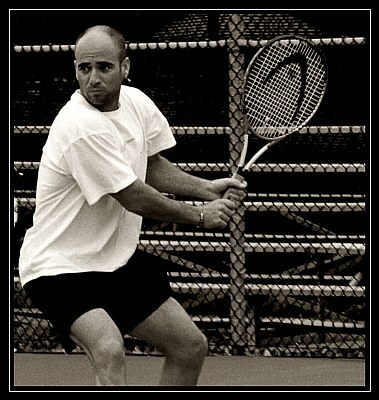 I thought I would look for an Agassi shot of mine to post during the US Open this year, the day he retired. I may have missed it by a day or two because he won a couple of rounds that he wasn't expected to. I had a couple of others from the start of his career, but decided to just post this one. He definitely earned my respect over his career! He was a good example of the "Iron John". So many to choose from, after so long an absence on my part. This image however was the obvious choice, not only because it is very well done, but also because Andre is my fav player of all time. The image is well balanced, and beautifully toned. More important than the technical merits however, you have captured the intense concentration that was the essence of his game. Congrats. I think tennis is one of those sports where every image caught can look like a sculpture of the male or female form. I also remember when he had hair. That wild 80's mullet with a head band :) I have some shots from about 1986. Maybe I'll do one of them later. One of the things I like about Agassi is the way he fought his way back to the top after he had an up and down career. It is always good to see a sports figure fight their way back to the top after suffering some kind of setbacks. I suspect with guys like Andre Agassi, money is not really an issue any more. It may never have been in his case. He was a child prodigy of sorts, that never really had what you could call a nine to five job. The pain and sacrifice is still real however. haha Andre shooting Andre, really nice action scene, I really like the lighting and tones, I remember when he had hair:) but when you married to brooke shields i guess the look works for you ! Hi again Andre, I don't follow tennis, but after viewing this I chanced upon an article about the match your referred to. Wow, playing with such pain & injections...but I guess it's worthwhile ($) for Agassi. Here is a copy of the original print. Thanks for the comments Hugo. Timing and moment are excellent in this photo, as is the pose / composition. I feel a bit ambiguous about the image quality. I figure it's either the scanning quality or it's a severe crop from the original, hard to tell. Good action shot, though. I won't question the toning, I guess that's something we'll never solve, nor need to solve. Good actiion shot, Andre! You've really caught the look of concentration on his face. I think the concentration is always there with sports shots. So you can't really miss it. You still have to take quite a few shots to get a couple worth working with. If you follow tennis, there is another aspect to the timing of this shot. Andre Agassi will most likely play his last match this week after a long and successful career. He should have been eliminated two days ago. Quite a story at the US Open this week! Fantastic timing! You've captured his concentration and strength well. You can see him think! The toning looks good too.